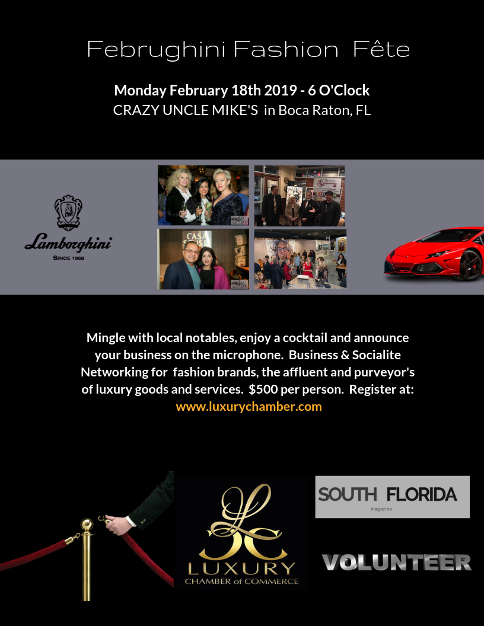 Join us on Monday February 18th 2019 from 6-9 pm at Crazy Uncle Mike's in Boca Raton, FL. Guests will enjoy business and social networking with luxury brand owners. Sample Lamborghini Champagne, exchange business cards and try some wine and cheese samplers from the charcuterie boards. Crazy Uncle Mike's is located at: 6450 North Federal Highway in Boca Raton, FL. 33487.